It may not feel like it in Southern California, but fall is officially here! Get in the seasonal spirit with these backyard decorating tips. Fall is officially here! With the new season comes a new to-do list for your home and yard. Are these essential backyard tasks on your to-do list this fall? Should You Buy Wood Patio Furniture? 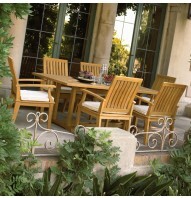 With Southern California’s dry climate, you may wonder if wood patio furniture is right for you. We’ve got the lowdown on the most popular types of wooden outdoor furniture and how to care for them in the blazing heat. Planning a party for Labor Day? We’ve got the design ideas you need for a sensational backyard party! Once you have the perfect patio furniture set for your backyard, you’ll need to know how to properly care for the cushions that come with it. Well-maintained patio furniture will last much longer, giving you your money’s worth and then some.